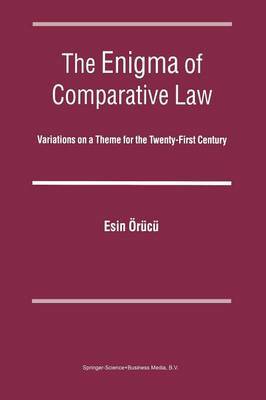 Viewing the contested theme Comparative Law as an `Enigma', this book explores its fundamental issues as sub-themes, each covered in two variations. After the Overture, the author pulls some strands together in the Intermezzo, uses a free hand in the Cadenza, and asks the reader to draw her own conclusions in the Finale. By this method two fundamentally opposed views are exposed in each Chapter. The what, why and how of comparative law, comparative law and legal education, comparative law and judges, and comparative law and law reform by transposition are explored. The author also examines current debates of comparative law such as law and culture, deconstruction of classifications, mixing systems, limits of comparability, convergence/non-convergence and ius commune novum. By following this two-pronged approach, the book covers many important aspects of comparative law in a refreshing manner not seen in any other work. It is provocative and discursive, bringing together for the reader major developments of comparative law. The book ends by asking `Where are we going?'. 'This book is a gem of comparative literature and will become compulsory reading for anyone seriously engaging in comparative research.' The International Criminal Law Review, volume 5, issue 3, 2005.